Huge Capital + Media = ? As of today in a society, mainstream media have influenced the society at large. And, several huge capitals have eyes on controlling (and acquiring) media. 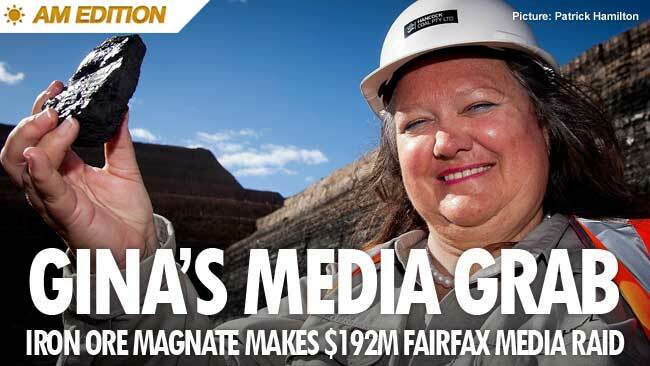 For instance, Gina Rinehart, the wealthiest Australian businesswoman owning Hancock Prospecting (an Australian mining company), became the Fairfax’s (owning The Sydney Morning Herald, SMH) largest shareholder. “Fossil fuels do not cause global warming” Really? As a result, if a huge capital owned media (or a medium), this collaboration would be remarkably empowered beyond the limit. Therefore, it must be strongly restricted that the capital (or a conglomerate) owns a media company. If not then, the collaboration would be a great chance to manipulate consumers and their right, and to hide the company’s wrongdoing. Therefore, it would build up unfair profits massively. To suppose what the collaboration results in a negative situation, let’s imagine if Apple (owned by Tim Cook) acquires media companies with billion dollars, and see what would happen. The 2 written suppositions as written right below have been given to promote readers understand that who owns the media (or a medium) is important. Firstly; Netflix, the best known VOD service provider in the world, could be taken over by Apple. Netflix would be a great compliment to iTunes! And, it would scare competitors such as Amazon and YouTube (and Google). Secondly; Comcast, the largest American cable company and Internet service provider owning NBC and Time Warner, also could be taken over by Apple. If Apple acquires Comcast, it could really help them in manipulating issues on various matters such as product liabilities (iPhone 6 Bendgate and other issues) and labour issues (riots, suicides and other issues in Foxconn’s iPhone factories). And, it would be the America’s most influential legal monopoly owning Time Warner and NBC. Anyway, I am using Apple iTunes (a media platform developed by Apple) to manage my Apple iPad and its numerous iOS applications, and to listen to music locating on my music library. Furthermore, I occasionally purchase music listing on iTunes music store. To be honest, I cannot deny that Apple is a genius for understanding a user experience, and applying the experience into a practical technology even if I was born in Korea where Samsung was originated from. As what media purposes for, media will function flawlessly when it uses for interacting between media and audiences, and representing for the public interest. However, the proper function of media would collapse if it is used for one’s profit. Unfortunately, this is happening now. McKnight, D., 2012. The Conversation. [Online] Available at: http://theconversation.com/why-does-gina-rinehart-want-control-of-fairfax-7774 [Accessed 2 April 2015]. Does anyone really care about copyright? 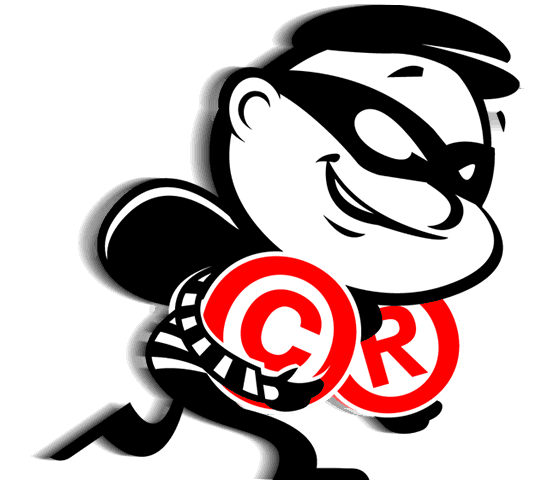 Copyright is to regulate the essential right and fair use as to protect one’s ownership of a content; thus, copyright must be treated like what ownership of real properties. When copyright is well-protected in terms of guaranteeing the profits of an owner, then both digital and analogue industries will grow up, and media industries will provide better products to consumers and customers. Illegal copying and distribution through Disk cloning, Warez, LimeWare, eDonkey and Torrent based on the P2P (Peer to Peer) Technology is going at a fast rate today. On the other hand, other DRM (Digital Rights Management) countermeasures of this illegal activity are inserting a PIN-code and a CD-key, phone & internet activation. Typically, record and film industries have lose out financially because of the illegal activities. Thus, in order to retrieve its financial loss, several media companies recently expanded their market coverages to the online markets which did not exist before – such as Samsung Milk Music & Video and Apple iTunes. These online stores now own a substantial number of subscribers. At the same time, Creative Commons Licenses (abbreviated as CCL or CCA) are used as a practice to allow use of content freely to encourage contribution of the public. Personally, I as the Wikipedia user ‘Zvezda Soyuz’ have contributed more than 10,000 words to the English and Korean Wikipedia. You can look up Wikipedia English and Korean entries ‘University of Wollongong’ and ‘List of universities in Australia’. Creative Commons is the way of the future because people can be more creative, and everyone can be a content producer. Collins, S., 2008. M/C Journal, Vol. 11, No. 6 (2008) – ‘recover’. [Online] Available at: http://journal.media-culture.org.au/index.php/mcjournal/article/viewArticle/105 [Accessed 25 March 2015]. The images, which involve two dimensions or more than that, distract people from a real viewpoint. Therefore; to figure out what are the denotation (what is there?) and the connotation (what it means? ), (Chandler, n.d.) the complex image as shown right next is referred to promote understanding these 2 terms correctly. Firstly, the denotation of the image is a computer-generated digital image, and is also firstly originated and digitally generated by scanning an illustration. As the image shows, the left-side man is getting run away from the right-side man. And, the right-side man, holding a sharped-object, is pursuing the left-side man to stab him. In front of them, a camera man is taking a video. Secondly, the connotation of the image implies the sensational distortion of media. 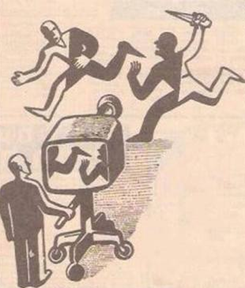 The satirical illustration, based on which negative situation media are intended to misrepresent for maximizing audiences and profits, is significantly illustrated. And, this illustration might be remarkably rationalized to whom got antagonism against the media and its negative aspects. Furthermore, I would like to ask whether it is possible to perceive and read it in more than one way. Whichever it is, my answer is ‘Yes’. Firstly, we do have to look carefully what the image directly shows, and indirectly implies. Hence the complexly-illustrated image, this image is including two dimensions. If we carefully look at this picture instead of a scene showing at the background, then there is an opposite event as following next: as the scene shown on the camera screen-view shows, the left-side man is trying to stab the right-side man, and the right-side man is screaming for help. Today, everyone is able to access to a social media network from multiple media platforms, and many of us believe that social media (or alternative media) are more reliable than old media such as television news. Alternative media are now more popular conveying what people truly want to know regardless of ages, classes and locations. The current media owned by huge organizations such as CNN, BBC and Al Jazeera, are generally anything but neutral – conveying biased messages for one’s benefit. Thus, audiences may get biased message unintentionally. However, people believe that social media such as Facebook and Twitter provide an alternative opinion, and convey more reliable messages than TV news. And, we can get the messages instantly from multiple devices such as a smartphone and a tablet. New media are providing an alternative source of news, and are encouraging social and political change. The medium is the message. Kassim, S., 2012. Policy.Mic. [Online] Available at: http://mic.com/articles/10642/twitter-revolution-how-the-arab-spring-was-helped-by-social-media [Accessed 19 March 2015]. As of today, media technologies are advancing remarkably fast, and this includes the advancement in video gaming. Video game graphics improves user experience to become more realistic. 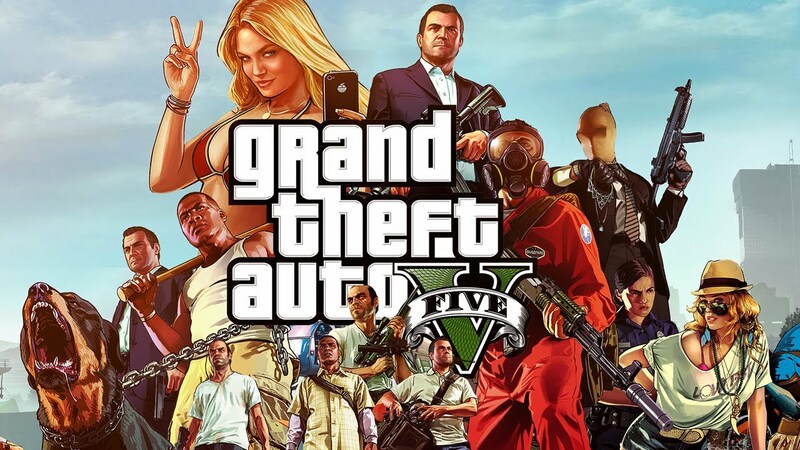 For instance, Grand Theft Auto (abbreviated as GTA), the very popular American video game published by Rockstar Games, is an example. Besides, this game is causing controversy by the assumption of video games making people to feel an impulse to commit violent crimes. Several media experts and sociologists have claimed that the violence of video games influences people negatively, and makes people to feel an impulse to commit violent crimes as well. (Iowa State University News Service, 2013) However, I do not agree about that, and I claim that we have to think negative social influences rather than a video game. According to an article on media effects studied by David Gauntlett, this argues that the effects model tackles social problems ‘backwards’ – blaming video games rather than negative social aspects. And, some criminologists studied the relationship between crime and violence, and they argue that various negative social factors (such as poverty and the behaviour of family and peers) are closely related to an offender and his/her aggressive behaviour. (Gauntlett, n.d.) According to the internal social factors, we have to focus what offenders and criminals are primarily originated and affected by, and not to blame for external or second-party reasons such as a video game and a violence content. Furthermore; a children, who are exposed to the media, is being treated as an inadequate that who he/she cannot decide their will carefully is defined as a non-adult. Thus, a children is being defined as a disqualified person who might imitate and cause a crime because they play a video game. (Gauntlett, n.d.) To counter the argument, we have to look carefully for other primary affections, such as the failure of education systems rather than playing a video game; the solid justification that adults are trying to hide their fault – the collapse of the education system. In the last analysis, what I would like to say is children can critically think and eligibly judge what are either right or not-to-do. 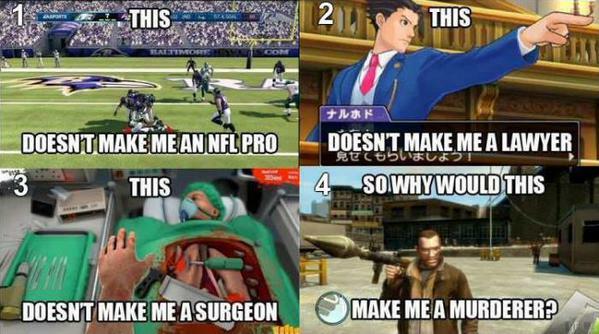 Again, I would like to say: “A video game will not make you a murderer”. Gauntlett, D., n.d. Ten things wrong with the Media ‘Effects’ Model. [Online] Available at: http://www.theory.org.uk/david/effects.htm [Accessed 19 March 2015]. Iowa State University News Service, 2013. Violent video games are a risk factor for criminal behavior and aggression. [Online] Available at: http://www.news.iastate.edu/news/2013/03/26/violentvideogames [Accessed 2 April 2015].